Last night my sweet, mechanically-apt husband worked on my trusty 13-year old Ford Ranger. It's been out of commission for the last three weeks. He diagnosed it as a problem in the fuel line, but he had to get a special fuel tool to mess with the particular fuel doohickey. Finally the special fuel tool arrived. Meanwhile I've been driving our 24-year old Lincoln Town Car. It's super comfortable (true) and oh, so stylish (well, at one point it was). I feel pretty safe with that much metal traveling around with me. Saying it's a boat is a pretty good description. Back to my truck, my husband drained some of the fuel and found water. Water is heavier than fuel, so after he drained enough of the fuel tank, he was back to fuel. So how did water get into the fuel tank? About the same amount of water that's found in one water bottle? My bet's on a certain three-foot tall, tow-headed little boy I see wandering around. A little boy who's favorite activity involves pouring water from one container into another. I won't mention any names, but I bet his initials are DB. What do you think? Yesterday Desert Boy and I went to participate in National Public Lands Day, a nationwide effort to help improve public lands. There was a site not far from our house. 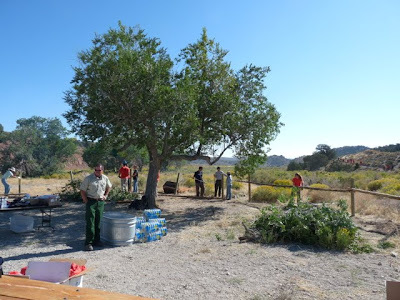 When we got there, volunteers were already working on building a new fence and trailhead area for a relatively new hiking/mountain bike trail at the Sacramento Pass Recreation Area. Here's a view of those volunteers from a different angle. 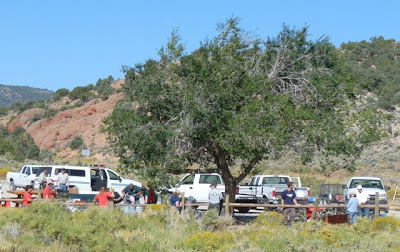 We hurried to catch up with one of the groups of kids that was hiking on the trail. 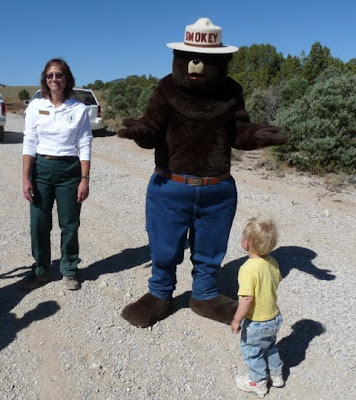 Part of the day was dedicated to getting kids more involved with nature and appreciating the public lands around them. 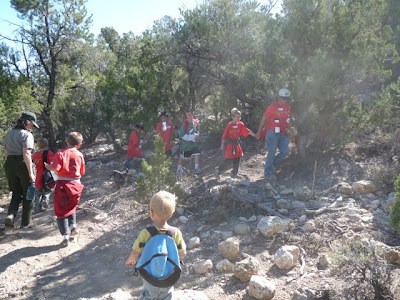 BLM and National Park Service rangers led this group of energetic kids. There were also three other groups. Desert Boy thought it was great to go hiking and wear his backpack again. 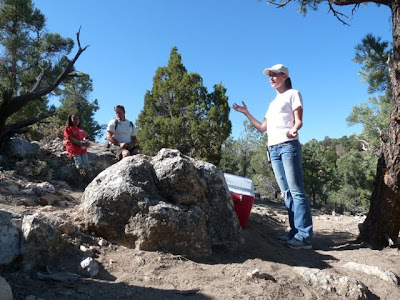 We stopped to listen to a BLM biologist talk about the components of a healthy human ecosystem. 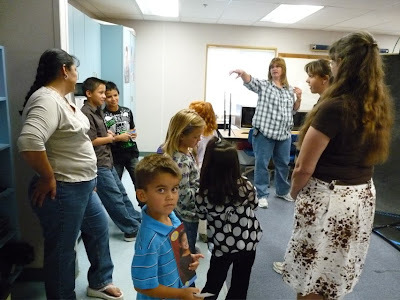 The kids liked the presentation, especially her analogies to chocolate chip cookies and receiving one at the end. Desert Boy went right to the front of the line to get a cookie. I guess he's got a bit of a sweet tooth. 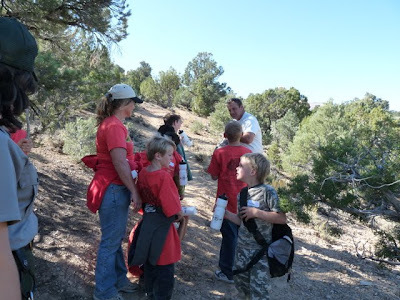 We had to take a break along the trail a little while later so that some of the kids could go "water the trees." 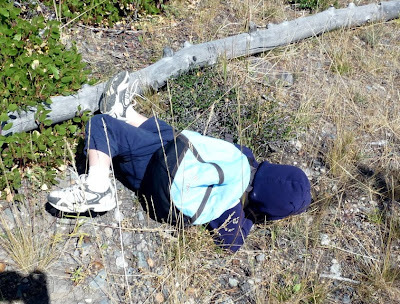 I'm sure that was part of the fun of the hike for them. They also really liked squirting each other with their water bottles. 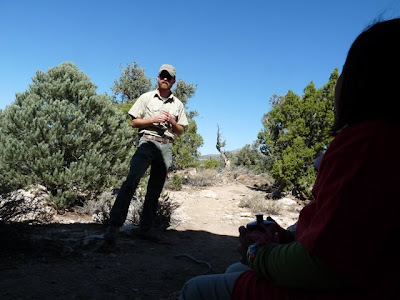 Next we found a BLM wildlife biologist who talked about healthy natural ecosystems, using pinyon jays and pinyon pines as an example. He had some pine nuts for everyone to snack on. 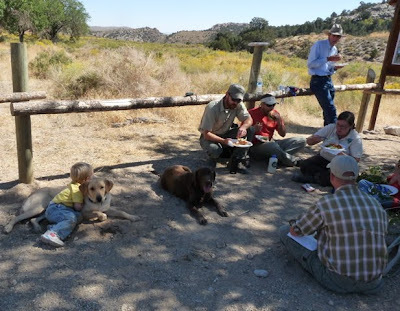 The hike had whetted everyone's appetite, so they were consumed rapidly! 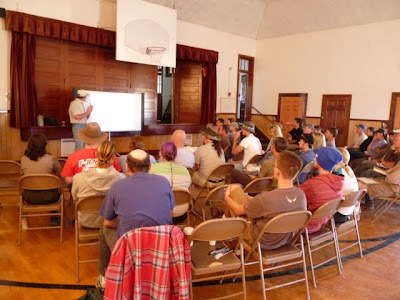 We hiked a bit further on and met up with a Forest Service ranger who talked about Leave No Trace principles. The kids seemed to understand what that meant--hopefully they'll actually practice it, too! Then it was time to finish the mile and a half long hike. Desert Boy walked it all, even though he asked to be picked up a couple of times. 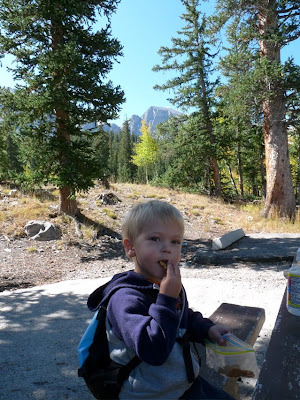 He got very excited at the end because he saw a school bus that would take us back down to the trailhead, and he loves school buses. He couldn't wait to get on it. 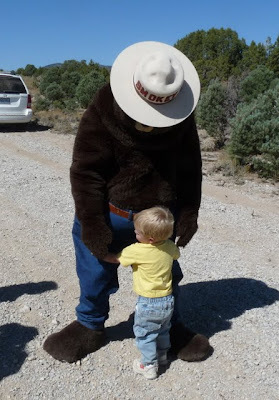 ...and then gave him a tentative hug. 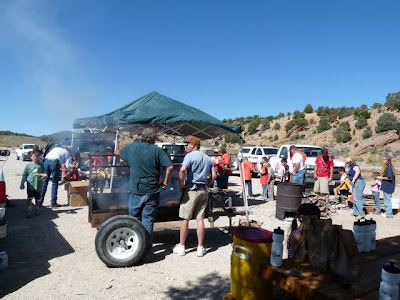 Back at the trailhead, grills were going with hamburgers, hot dogs, and chorizos for a yummy lunch. 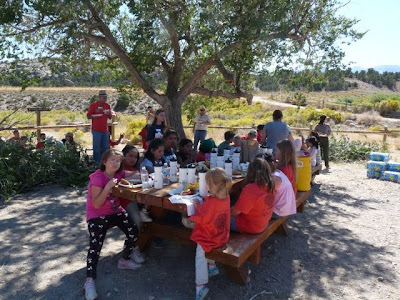 The kids crowded the picnic tables to eat. 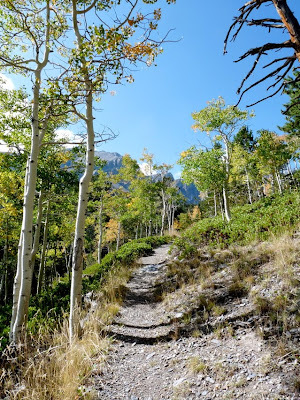 I had never known the trail existed, and in fact there are even more new trails in that area, so we'll have to go back and check them out. It obviously took a lot of work and coordination to pull off a successful National Public Lands Day, and thank you to everyone who contributed. We appreciate your efforts! And as a reminder about public lands, tonight begins the weeklong documentary series about the National Parks. Can't wait to watch! It was a cool morning, and Desert Boy was very excited to go for a hike. He got to carry his very own backpack. Desert Boy can walk fast now, so it can sometimes be a little challenging to keep up with him. Nevertheless, when he starts going towards some obstacle, he can have some funny moves. 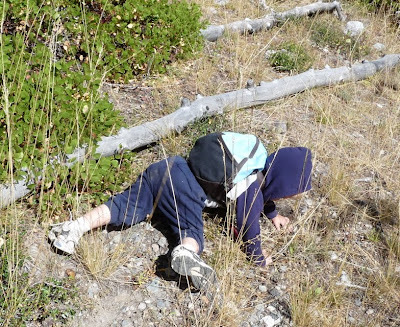 He rolled back to the trail, got up, and was marching ahead in no time. 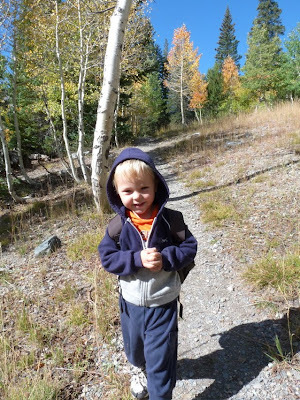 He doesn't mind a few scrapes and bruises as long as he's on an adventure. 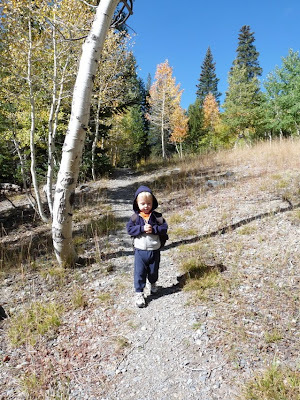 The aspen trees were just starting to turn color, and the air had a crisp autumn feel to it. 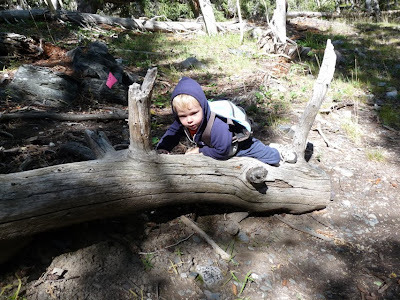 Desert Boy eventually found another obstacle and was happy to climb all over the log. But he was even happier when I declared it was snack time. That's what makes hiking worth it all. 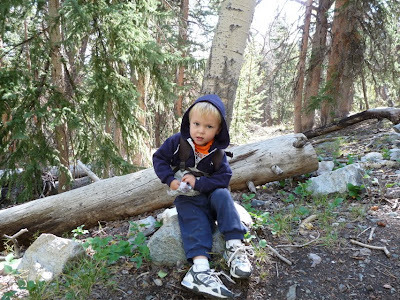 And when we got back to the trailhead it was time for another snack. He likes his backpack because all he carries is a diaper, a little bottle of water, and snacks! Here are a few wildlife photos. Hopefully soon I'll get around to downloading more photos! 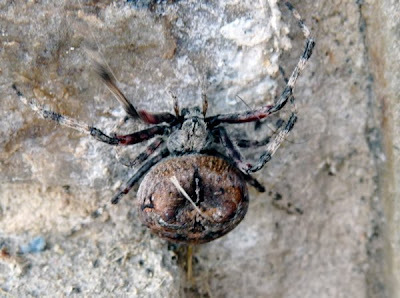 I think this is a crab spider. 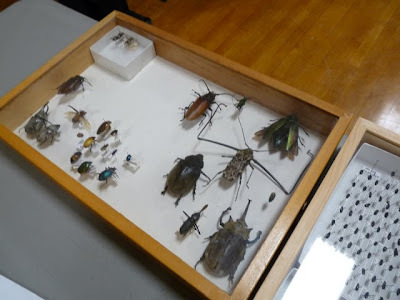 It was about two inches long. 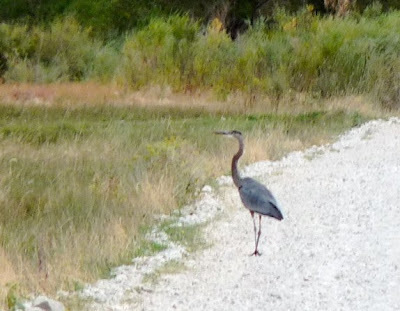 I saw this Great Blue Heron flying around the meadows, and then it landed on the road. It won't be around too much longer as the temperatures keep getting cooler. 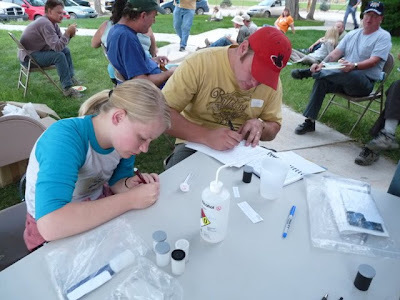 Last weekend Great Basin National Park hosted a Beetle Bioblitz. 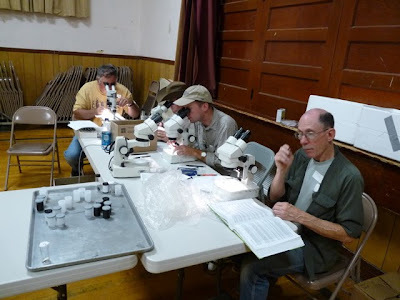 During a 24-hour period, more than forty people traipsed throughout the park collecting beetles, searching a variety of habitats from 5,300 feet to 10,800 feet. 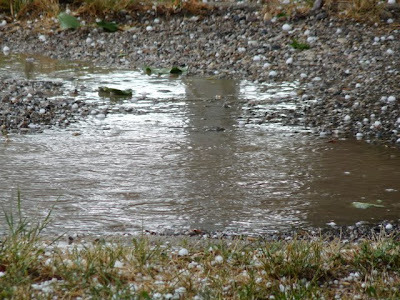 On Monday we had some wonderful rain. It brought the temperatures down considerably. 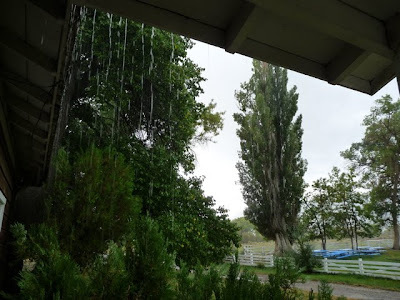 It's been weeks and weeks since we've had rain, so it was great to hear the pitter-patter against the window panes. 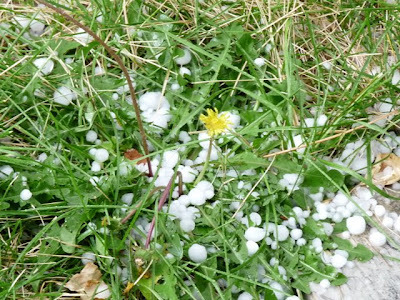 But then we got some hail--that wasn't quite such a nice sound. The little dandelion managed to survive the hail. We had storms throughout the day, with lots of lightning and thunder. 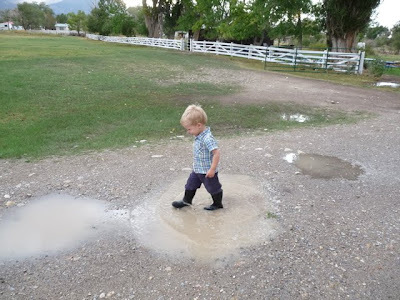 Late in the afternoon, Desert Boy got suited up with his irrigating boots and we went out to splash in puddles. 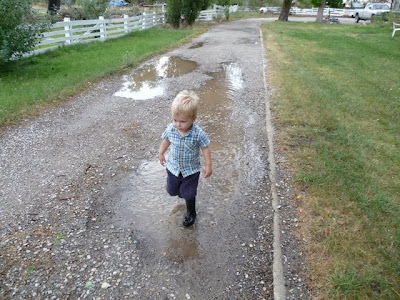 He particularly wanted to jump in the puddles. 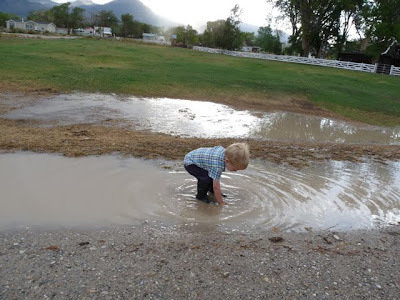 It didn't take him long to get wet. Very wet. Especially when he fell down. He would have played a lot longer, but it was a bit chilly and he eventually decided he wanted to go in and get warm. What? A toddler with a modicum of common sense? What is this world coming to? We had some tree trimmers come a week ago. 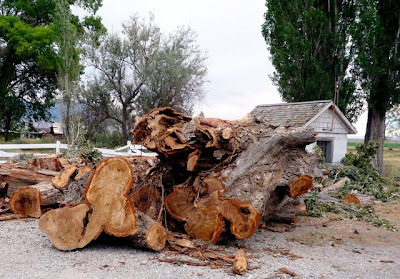 They were planning on trimming the branches near the power lines, but it quickly became apparent that there was more rotten wood than good wood in this old Lombardy poplar, so they ended up taking down the whole tree. The pieces are still in our driveway, and I keep trying not to run into them. 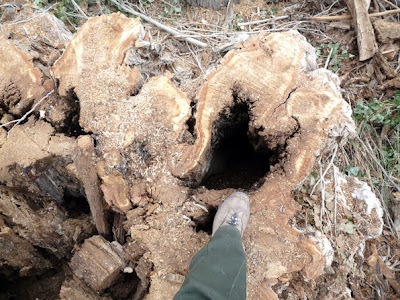 Here's part of the rotten trunk. 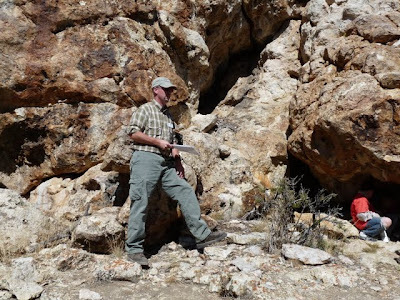 It was over eight feet wide. 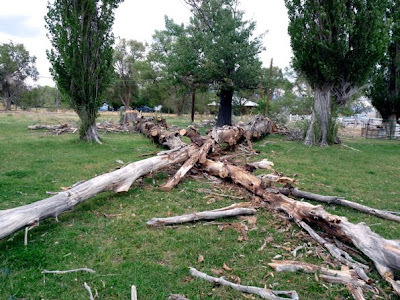 It's likely that the tree was over a hundred years old. 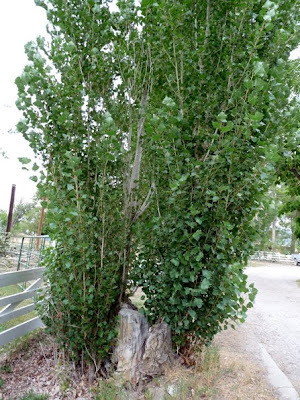 Lombardy poplars are native to Europe (and named for Lombardy, Italy), but they were popular trees planted by pioneers because they grew so quickly. They grow up rather than out, so they have a distinctive profile. 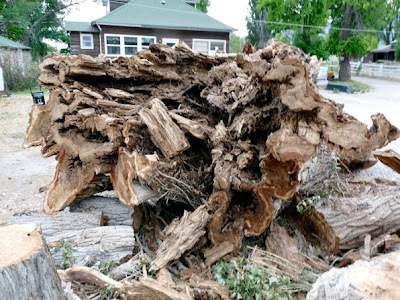 The wood isn't particularly strong, though, and as the tree age, it often reaches a stage where a large wind storm will blow it over. 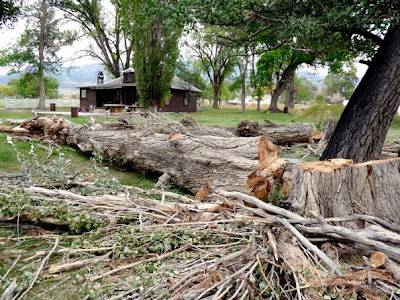 A couple other trees near the cookhouse were in need of cutting, too, before they fell in the wrong direction and caused more damage. I was very glad that the tree trimmers took the trees down. 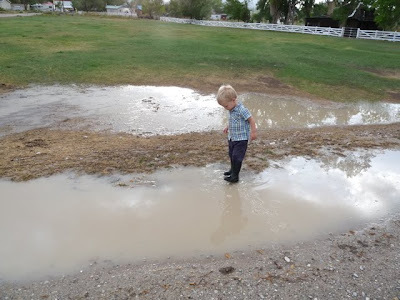 My husband was plotting on howing to do it using backhoes and other ranch equipment. It sounded a little scary to me. Trees weigh a lot! Here's another view of those two trees. You might think I'd be sad about the trees coming down, but I'm not. I didn't want them to fall on me. And Lombardy poplars tend to regenerate after they've been cut. This is one near our driveway. 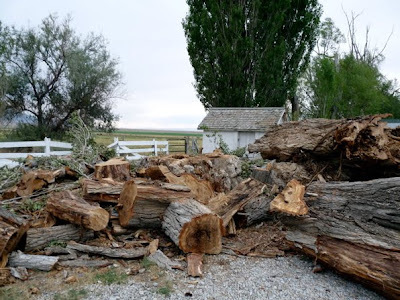 The tree fell about six or seven years ago and was cut at the stump. Now the regrowth is already over thirty feet high and looks good! 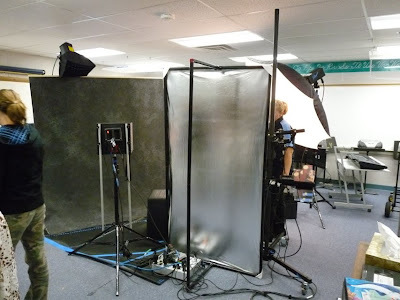 It was time for school photos the other day, and we were able to take Desert Boy. Doesn't he clean up nicely? 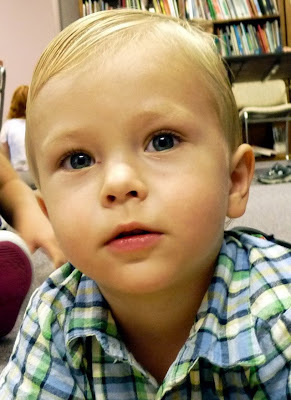 He wasn't too sure what to think about all the photography equipment, but he cooperated well, even with all the hair spraying (with water) and combing. Here are some of the kids in line, with teachers and parents close by to make sure they didn't get messed up at the last minute. What Desert Boy liked best was playing with the older kids after his photo was taken. 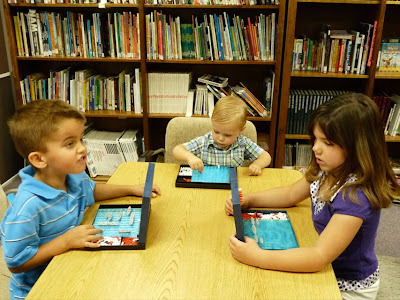 He was introduced to Battleship. 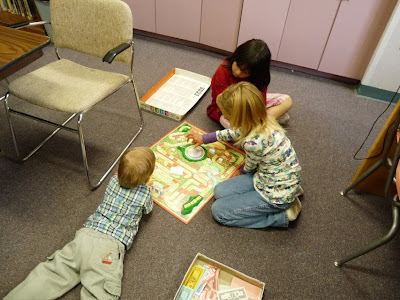 I remember playing this at Grandma's house years and years ago. He got some lessons from his cousin. It was a good afternoon! We've had a plethora of wonderful peaches lately. Some of the ones that fell on the ground bruised a bit, so I decided to try something different with them--make fruit leather. I always called it fruit roll-ups, but I guess it's the same thing, except the homemade version is so much healthier. I found various recipes on the Internet and decided to incorporate a few to make my own. My ingredients: peaches, honey, lemon juice (and for one batch, cinnamon). 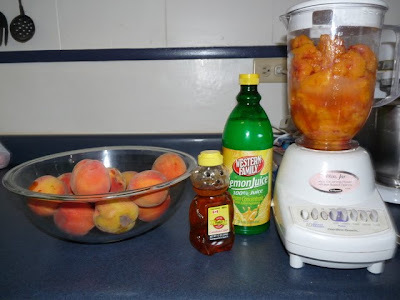 I took the skins off the peaches and cut off the bad sections, putting the good parts into the blender. I added a couple squirts of lemon juice (maybe 2 teaspoons worth), and about 1/4 cup honey. Then I turned the blender onto puree. 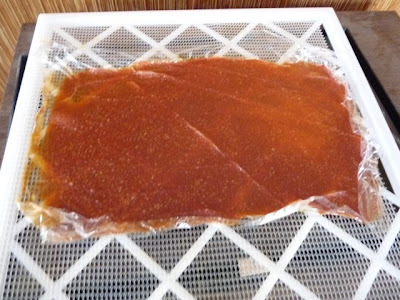 I put Saran wrap down on the dehydrator sheets, and then poured the fruit leather mixture onto the plastic, using a spatula to spread it out into a somewhat uniform thickness. Next it was into the dehydrator at 135 degrees. Some recipes said for 6-8 hours, but with the thickness I had, it was more like 10-12 hours. 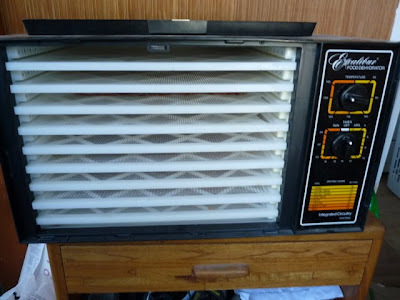 Other variations are to put the fruit leather into your oven at the lowest setting with the door open for a couple hours, or to put it onto big cookie sheets covered with cheesecloth and let dry outside in the sun for a couple days. The end result is a firm fruit leather. The taste of the peaches is really concentrated, so it's almost like candy. You can also roll up the plastic, cut it into pieces, and put into Ziploc bags for storage. 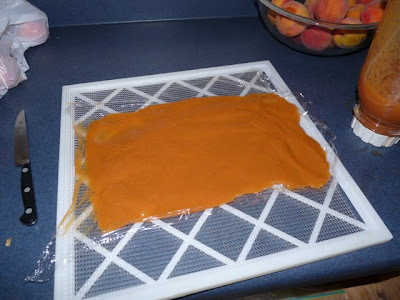 If you want to keep the fruit leather for awhile (say, because you're so tired of peaches), then you can put the Ziploc in the freezer and it will keep for a few months.